Jill Folan completed "A Mile of Mayhem," the first of what she envisions will be a three-part series about vampires in Streeterville. STREETERVILLE — Jill Folan spent 181 days of 2012 in Streeterville, while her husband Mike was undergoing treatment at Northwestern Hospital for double hit lymphoma. But for much of the time Folan, a communications consultant from Hyde Park, was at the hospital, her mind was in a different Streeterville: one overrun by evil vampires nesting in the abandoned Prentice Women's Hospital while a benevolent physician — himself a newly-turned vampire — fights his hunger for blood at another downtown medical center. Her first book, "A Mile of Mayhem," which she wrote between June 2012 and June 2013 during her husband's treatment, was self-published in early November: first as an e-book, then in paperback. Folan, 53, will appear at Local Root Tuesday for a reading and book signing from 2 to 5 p.m at 601 N. McClurg Ct. Books will be available for $10, or a signed copy is free with an order off the cafe's afternoon tea menu. The full title identifies it as part of a three-installment series following Dr. Ian Bennett, a newly-turned vampire trying to keep his cool around blood bags at his downtown Chicago hospital. Folan "wanted to write a book since I was a kid," she said, but "always thought that it needed to be kind of 'great literature.'" Though she was an avid Ann Rice fan in high school and read vampire-centric books long before the genre's recent resurgence, Folan said she'd given up on writing a book long ago based on the attitude that "if it wasn't going to replace 'Great Expectations' in English class, then why bother writing it?" But "then my husband Mike and I find ourselves with this lymphoma diagnosis," she said. "And we're in the hospital, and I know that we're facing a lot of time in the hospital, and I'm thinking, 'How are we going to do this and at the end of it still be speaking to each other?' Because if I spend all day talking to him in this hospital room we'll go crazy." So when she wasn't by her husband's bedside drawing inspiration from his care team, Folan was stooped over her laptop in Northwestern's lobby, filling 258 pages with sci-fi fiction inspired by reality. "Writing the book ... was a great way to put to use all the medical stuff I was learning from being in the hospital all the time," said Folan, who works for Towers Watson. "It was a great way to be there, but also escape it a little bit. "I think it helped me feel like I was in charge of cancer," she said. "The way I wrote it in the book, I was in charge of it instead of it controlling me." Her husband has since been released from the hospital and his cancer is in remission. Folan's time inside the hospital wasn't her only source of inspiration. Local Root, the Ritz-Carlton, Old Town Social and the old Prentice building all make appearances in "A Mile of Mayhem." Northwestern isn't identified by name in the book "because I have people doing things in there that Northwestern employees would never ever do," Folan said, but "it's this mythical Downtown hospital, bordered on one side by the lake, on the other side by Michigan Avenue. I mean, it's clear." 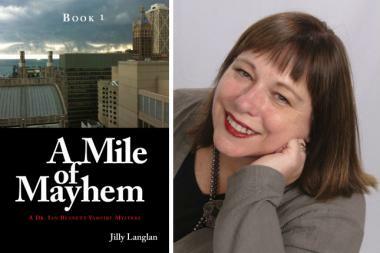 The book is written under the pen name "Jilly Langlan," which is a combination of Folan's maiden name, Langendorff and her married name. Folan said she hopes the Streeterville community will appreciate her tribute, which "comes from a place of love" for the neighborhood. She plans to start book two of the series in January, which will require her to spend lots of time in the neighborhood that inspired her. She said she'll be perched in Streeterville cafes "as much as possible" watching closely for local news that can help drive her story, as it did with the first book. "When I started writing there was the big controversy about whether to tear the old Prentice down. I built that into my story because that's where I imagined the evil vampires would live," she said. "I'm so excited that they're tearing it down so I can work that into the second book."